It’s what you do with it that matters. That’s what the Four Seasons / Seasons of the Year reading can do for you. As always, it isn’t a prediction of what will happen, but signposts for the road along the way. I created this layout specifically for New Years & special occasions. Like the yes or no reading, it helps to get our head around that transition from old school prediction to modern guidance, possibilities, even probabilities…just not certainties. The nice thing about the Seasons reading is the way it reaches through time, even though it is a single sitting. Daily Meditation readings spool out literally through days, months, and years. This reaches out from a single sitting, and creates the series-of-snapshots, sense of movement that you can get with multi-card layouts. What it gains in time-work, it loses in focus. This spread really shines when the intent is general guidance like a road map through the year to come. A specific question is much better served by a one-card snapshot, a pathway or a yes/no reading. The Seasons reading, like a pathway reading, can give you a sense of the direction things are headed. It is food for thought and fuel for change. Unlike the pathway, this layout lets go of the past, starts right now and looks ahead. It is inherently hopeful and optimistic for that reason alone. That isn’t to say every Seasons reading is a rose colored glasses Pollyanna frolic through rainbows and unicorns, but it’s proactive and it’s pragmatic which I personally like better than blowing disingenuous sunshine and roses. It can give you a heads up to the energies that might be ahead. Even if it doesn’t let you know what’s ahead, it might give you ideas of which way to turn when the unexpected happens. Either way, it can help make the passage of time a little smoother ride. Q: Could you please do a general reading for the New Year? No specific questions, I just want to see what turns up. I love doing these open “general” readings. Thank you so much for trusting me to do that. As you know, this card spread draws four cards, one for each of the coming season with an overall year card at the end. The first four cards are sort of an “idea for the quarter”… a theme or guiding idea, or important decision point for that period of time. This will give you a ‘heads up” to potential decisions and energies, but not a specific prediction by any means. The final card is the same idea, but looks at the whole year instead of the specific season. Looking at the general pattern of the reading, it grabs my attention that you have two “nine” cards. The typical thing would be to ask what, if anything, nine means to you….has anything significant in September or on the ninth of a month, a place with nine prominent in the address, things like that. Numerology isn’t my strong suite, so you might want to google what nine means in numerology from a couple of different sources and see if anything jumps out at you. Also, most of your cards are from the minor arcana portion of the tarot deck, followed by two major arcana cards at the end. That grouping together of the minor then major arcana card makes me think that Balance is the big, key idea overarching the whole reading…the key idea theme for the whole reading, and the whole year. You might also find the year getting off to a slow start and really picking up momentum at the beginning of next year. The first card is for winter, now through about the end of March. It is the nine of wandswhich means “acceptance”. The advice is to basically do a new year’s retrospective and resolution on steroids. What this card is asking for is a little harder than your typical resolution in that it asks for honesty, and acceptance, no matter how hard the realities might be. The easy part is that it asks you to look at the here and now…where is life for you now? Are you happy? It’s ok if the answer is YES! Take a good hard look…if there are things that are wrong and need changing…that OK because now you know what you need to do. I you look around, you might find that things are pretty good, and that is even more OK…then you know what to be thankful for and what to continue to walk toward. 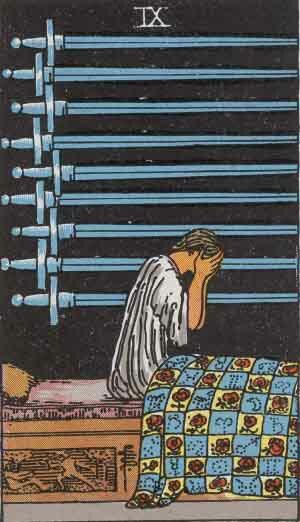 The next card is the nine of swords. It symbolizes useless regret. This card is for the spring, aprox. March through June. Ironically enough, this is a great card for spring, even though it doesn’t look like it based on the artwork on the card. This card is all about letting go of things that no longer are useful or helpful. It is a card of spiritual “spring cleaning” in a way. Spring is a time of fresh starts…so if you have beating yourself up over something…now is the time to learn from it, but then release it and move on. If there are old habits…literal ones or “habits of thought”…attitudes and philosophies…that are obsolete and no longer server your highest and best purpose in life…the spring is the time to get rid of them. In this part of the year, the wind will be at your back for making positive changes …”out with the old to make room for the new” so to speak. It really is a logical next step after the last card…after an honest assessment and acceptance of things as they are, it makes sense to let go..out with the old to make room for the new, now that you know what is what. Summer, July to September, is a time of bright energy where it is very easy to get carried away. 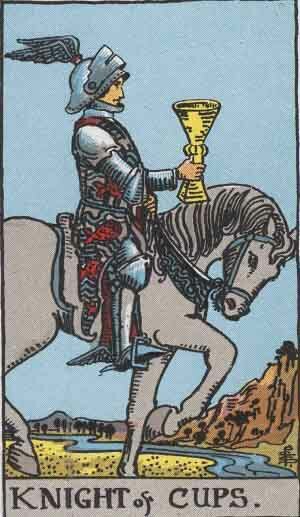 This card is the knight of cups and means “sufficiency”. 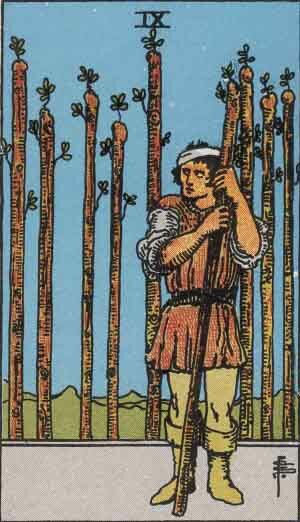 This card is just a gentle reminder not to get too carried away…don’t sweep away so much of the past, and past learning, that you forget what you learned and repeat mistakes. Don’t bite off more than you can chew, either. Know your limits so you don’t get over exhausted or over extended. Allow yourself a comfortable amount…allow yourself enough of what you need…but don’t worry about going beyond. Achieve, not over-achieve. Reach, but not over-reach. Fall, October through next New Years, is guided by the major arcana card Temperance. It is balance, but of a different kind from what the Knight of Cups is talking about. The knight is talking about an internal, small-order, intense, focused sort of balance. 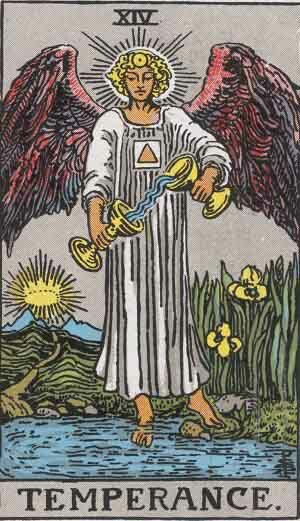 Temperance is talking about an overall “big picture” kind of balance. For example the balance between work time and play time, a balance between using logic and intuition, balance of body mind and spirit….that sort of thing. 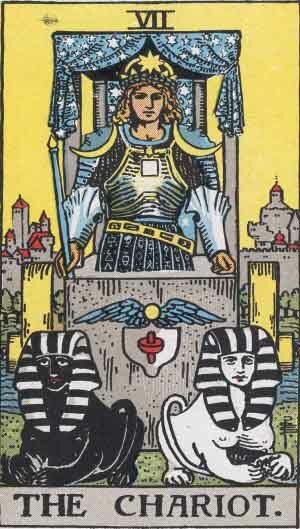 The Chariot, being the other major arcana card, seems to tie most directly with the Temperance card and feeds the notion of building energy over the course of the year, more toward the beginning of the next year. Chariot means awareness, and also resonates with the idea of self-awareness and self-acceptance hinted at in the first card. It is very much a ‘heads up and pay attention’ kind of card. The more I think about it, the more it seems tied to that following year…so heads up. It also adds urgency and importance to self-examination and spiritual house cleaning aspects of the earlier cards. Those things may be important steps to prepare for the changes and energies to come. To sum up, I like to just make a note of any random impressions, so any messages can get through that might be separate from the cards themselves. For whatever reason, that part typically starts with a color…for you I see yellow, like a rich goldenrod sort of color. Maybe daffodil. Sometimes that color is associated with career, or wealth, but in your case it feels very much like flowers, or maybe a flowered dress….something that screams SPRINGTIME. I don’t know if that is to draw our attention to that time of year in particular, or if those images have some other meaning or association for you. That’s the kicker with this portion…it is the raw images, and up to you to decide what…if any…meaning they might have. What you think it is or what it might be is the the meaning to go with. This is about engaging your intuition too, not just generalities. There is a little bit of bright, spring green, like leaves behind the yellow flowers. Have you ever read the “WitchLight” or the “Modern Witch” series of books by Debora Geary? They are some of my all time favorites. I mention it because the dress / flower reference reminds me of one character, a fire witch coming into her own…the books are as much about self-discovery, self-esteem, and personal grow as the whole “magic” thing on the surface. So maybe this is symbolic of you coming into your own, recognizing and growing your skills, confidence, and “powers” so to speak. Or maybe it is just wardrobe advice. I can’t tell…again that’sup to you. And there the energy ends. I hope that this was a helpful reading for you. Thanks again for letting me do an open general type reading. Some of the neatest things always come through with those. Enjoy the dress and flowers!